Well first off, it may seem odd that the picture does not show the front of the bottle. Well I can explain. The bottle with it’s lovely case was given to me by AliceInWhiskyland for Christmas. At the time Glenfiddich had a promotion where you could send in a postcard with a message to make a personalized label. So there is a very personal label on this particular bottle which I was not inclined to share. The plus side for you is that you get a good view of the actual whisky. Glenfiddich was the first distillery to really produce and market single malt whiskies. Some people view it as the distillery that started the whole single malt trend and for that many a whisky drinker are grateful. 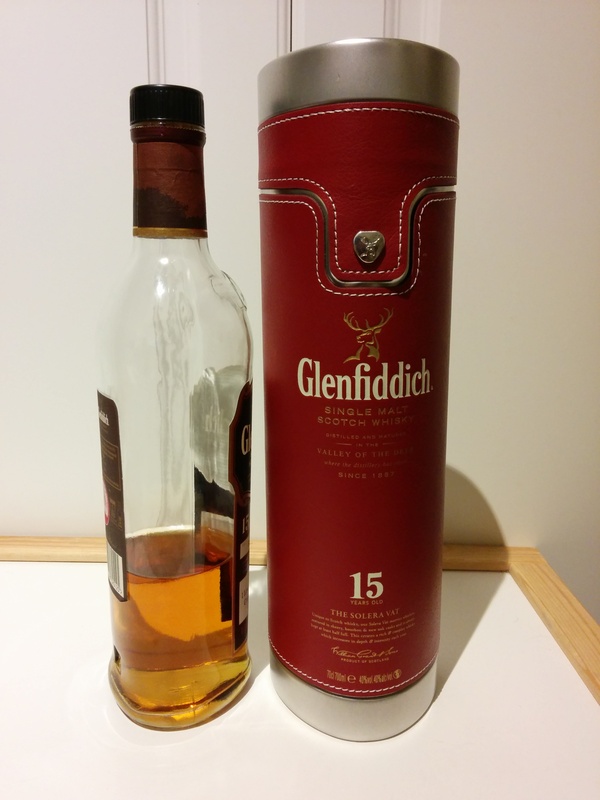 The Glenfiddich 15 year solera is a special one amongst the core Glenfiddich range. Solera is a method of producing liquors where a continuous vatting is used. In the case of the Glenfiddich 15 Solera, there is a large oak vat that has continuously held whisky since the start of this expression. They add whisky in and take whisky out but never fully drain the vat, so theoretically drops of the original spirit are still swirling around in the vat and your glass. It’s a neat idea for maintaining consistency and in this case I believe it has done very well. Oh yeah this has got a nose! Overwhelming poached pears and gummies. Pear cider. Crab apples and apple blossoms. Reminds me of a crab apple tree that grew at the Sepulveda Gardens in Encino. A touch of lavender. A bit of spice like orange peels and cloves. Sweet poached pears in a light syrup with a touch of cinnamon. A bit of canned peaches in syrup. Ends with spicy oak. Spicy oak with caramel highlights. A bit like the after taste from each a fruit cup. Lasts a good while. I consider this to be a very whisky-ish whisky. I like it quite a bit and I feel that it has the qualities of whisky which initially attract a lot of people to the spirit. It doesn’t have any funkiness. It’s well rounded, smooth and comforting. It’s also a good value. You can find great deals on this expression in grocery stores here in Edinburgh. I think this bottle was about 32 quid. Not bad.